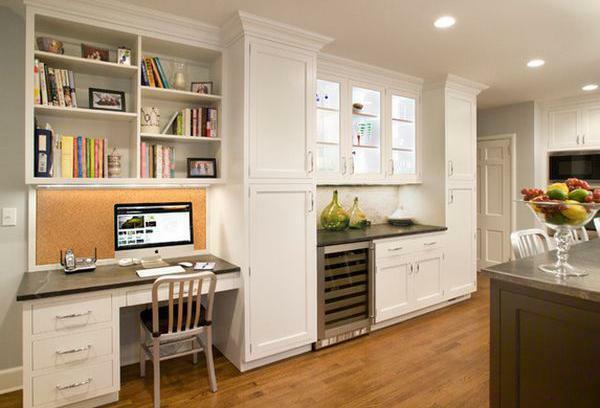 Space saving ideas for storage and smart home office designs help maximize small rooms while efficiently using valuable living spaces. All large and small rooms give great opportunities for a thoughtful designer. 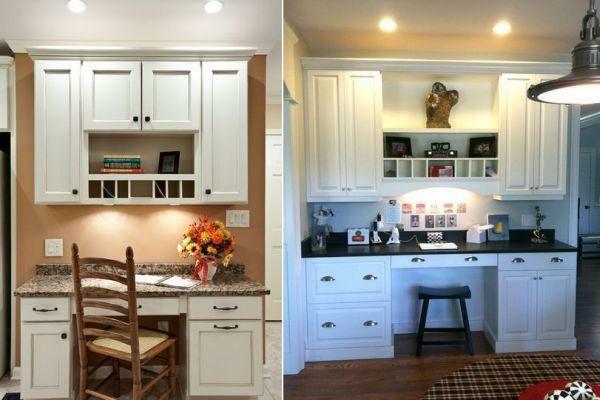 Hallways and kitchens, bedrooms and dining rooms have hidden extra spaces for small home designs that can be discovered. Lushome shares wonderful space saving home staging tips and interior design ideas for small home offices arranged in multifunctional rooms. 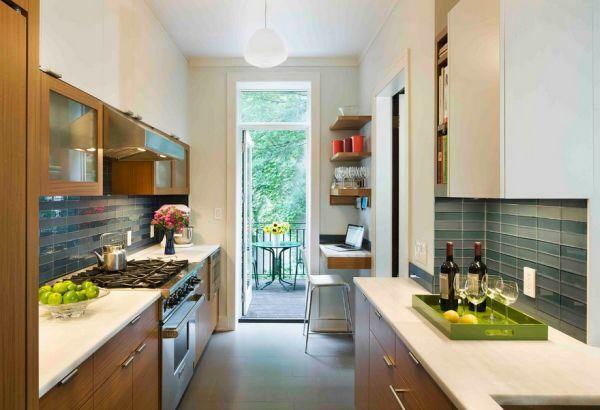 Kitchens are especially great for designing convenient and functional small home offices. 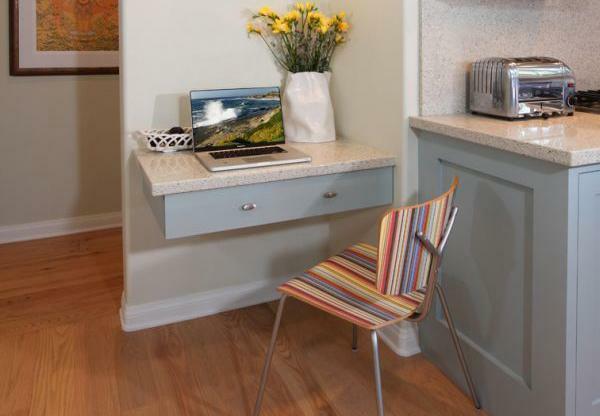 Modern kitchens are ideal for adding small office workstations to small homes. Any empty wall area can be attractively converted into a small home office desk with storage shelves. 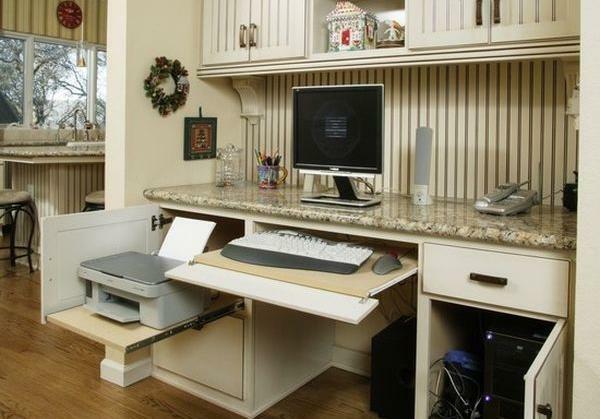 A small home office workplace can fit any corner of your kitchen, bedroom, dining room, under staircase space or hallway. The ideal options are the empty walls and small spaces around. 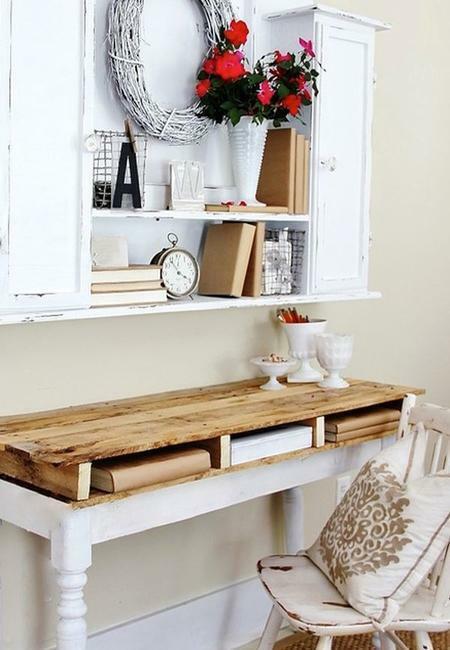 Wall shelves or a hanging cabinet, a small office desk and a chair do wonders. 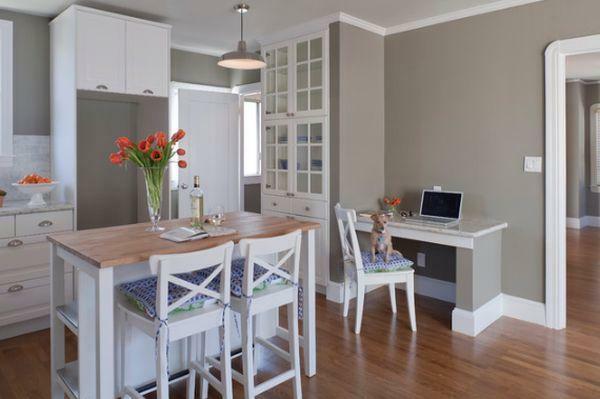 Home organizers help to maximize small spaces and create comfortable and efficient small office designs. 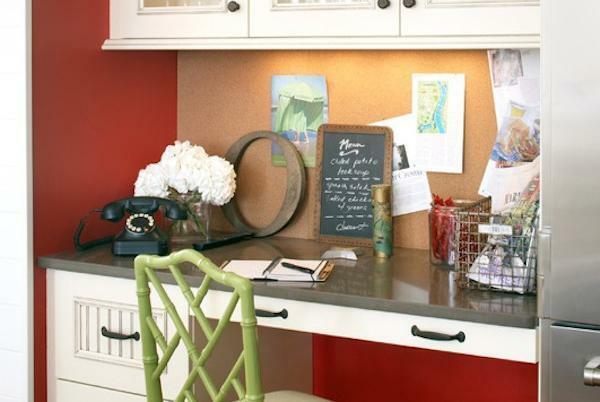 A wall calendar, a not board with recipes or photos make good decorations for home office spaces. A few open shelves or a cabinet with drawers, – any small furniture for storage highlights good office organization and helps create neat and elegant interior decorating. Storage furniture on wheels, retractable drawers, modular shelving or portable cabinets provide storage for printers, fax machines and computers while allowing to alter home office designs. A pretty curtain can hide storage boxes under the office desk. Using an attractive basket ot fabric tote instead of a boring garbage bin can add a charming accent to your small office interior decorating. 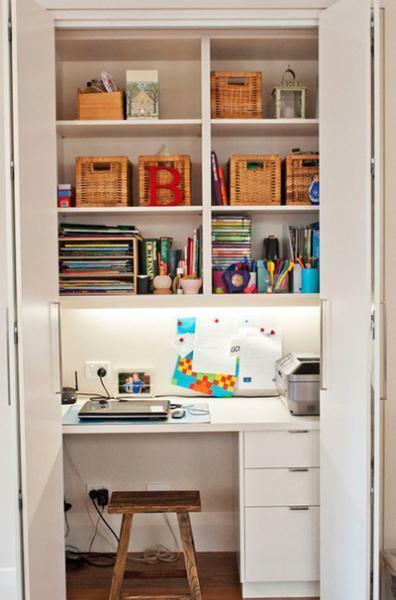 Converting closets into small office workstations is great space saving idea to maximize small rooms and visually stretch home interiors. Computer monitors can be mounted on the walls and other office equipment can be places on wall shelves to create even more space in small home offices. Office lighting design is another important element of creating comfortable and efficient working spaces. 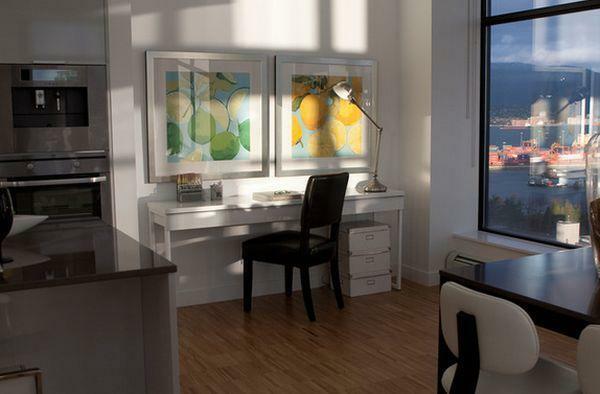 Natural light is ideal for small home office designs. Good artificial lighting and task lighting fixtures, especially built-in lighting design and energy efficient contemporary lights, make small home offices look bright and spacious. 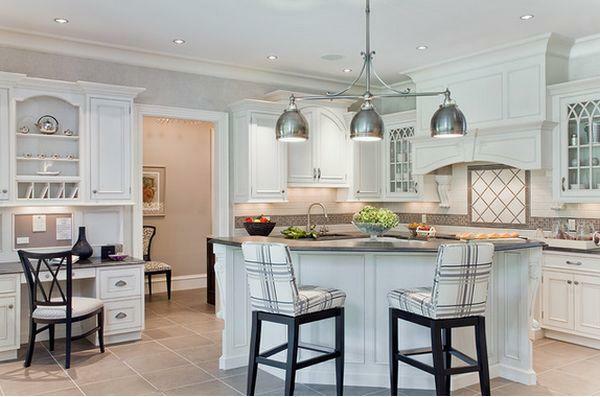 Proper and thoughtful lighting design beautify small spaces while offering comfortable places to work or make crafts.